The article then offers suggestions and ideas to help you control costs during your bathroom renovation, including how to choose the right paint color to give your bath the biggest bang for the buck, how to save on expensive tile, and why you should choose quartz rather than marble for countertops. In addition, the article includes tips for how to choose great lighting and luxurious shower heads, plus why you should consider installing a bidet and bringing smart technology into the bathroom. There are also tips for choosing an exhaust fan, using a trim kit, and replacing an ugly mirror, plus links to competitively priced products that Reviewed.com editors recommend. To read the article in entirety, click here. Cindy Bailen also featured Edesia’s Dianne Aucello in 10 Reasons You Should Work With A Kitchen Designer on Reviewed.com in November, 2018. 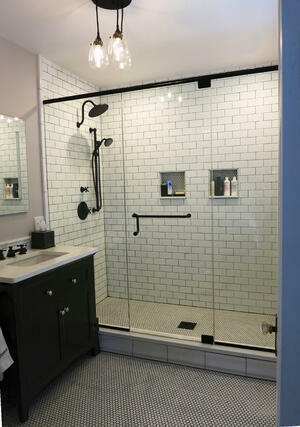 If you’re considering a bathroom renovation, come talk to us! Edesia Kitchen & Bath Studio is a Best Of Houzz award winner for client satisfaction in 2017, 2018, and 2019. Take advantage of our free consultation and estimate by contacting us online, or by calling 781.238.8800.